Pottery, basketry, sculpture, costumes, and textiles of native North, Central, and South America, including Spanish Colonial art produced by native artists, from the post-European contact period starting in 1492 through the present. 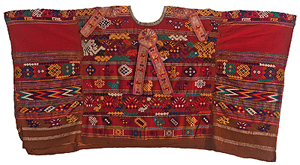 This elaborate early huipil from Comalapa is made of natural brown cotton with complex woven detail and silk ribbon accent. 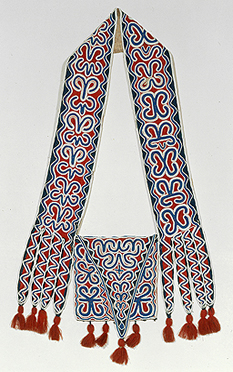 The Comalapa huipil is known for a red band across the shoulders on a brown body, but this piece is a dramatic elaboration of this theme for ceremonial purposes. Designs arranged in horizontal patterns across the garment incorporate a wide variety of traditional Maya motifs such as ducks, dogs, monkeys, and birds. Square designs may represent the earth and sky. Although designs have evolved tremendously in the highlands, the Comalapa huipil remains very consistent. Beautifully embroidered bead shoulder bags are among the finest artistic accomplishments of Seminole and Creek women. During the 19th century, when Native American people were experiencing extreme cultural upheaval and tribal wars against relocation, these bags were worn with pride by Indian leaders as part of their best dress for negotiations and other special occasions. Their distinctive style consists of a square pouch with a triangular flap opening and a broad shoulder strap. The shoulder bags were first executed by finger weaving, then, in the early 19th century, the women learned new sewing techniques using commercial wool cloth. The cloth was cut to shape, sewn, and decorated with embroidered glass-bead designs. The women either used ancient designs deriving from the Mississippian period or they created significant new curvilinear and geometric designs. The designs on this shoulder bag have spiritual significance. Scrolls representing breath or puffs of smoke are said to be symbolic of the Creator, Breathmaker. The small cross in the center of the flap represents the four directions of the logs of the sacred fire. 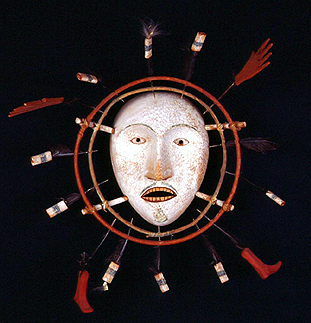 This mask depicts a human face with a number of projections which represent soul abstractions. The piece was executed under the U.S. Indian Arts and Crafts Board in an effort to promote native handicrafts. The name Yup'ik is the self designation of the Eskimos of western Alaska and is derived from their word for "person" (yuk) plus -pik, meaning "real" or "genuine."